Fred A. Leuchter, 45, is an engineer living in Boston, Massachusetts, who specialized in the design of execution hardware used in prisons throughout the United States. One of his major projects was the design of a new gas chamber at the Missouri State Penitentiary at Jefferson City. In January of 1988, I was in Toronto, Canada, assisting in the defense of Mr. Ernst Zundel, a German-Canadian who was on trial for spreading false news by publishing "Did Six Million really Die? ", a booklet which challenged the prevailing view that six million Jews were killed by the Nazis during World War II, primarily through the use of gas chambers using hydrocyanic gas (Zyklon B gas). Ernst Zundel had been previously tried on the same charge in 1985. The trial lasted seven weeks and ended with a conviction and a sentence of fifteen months imprisonment. In January 1987, the Ontario Court of Appeal overturned the judgment because of grave errors in law and ordered that a new trial be held. The retrial began on January 18, 1988 and at the time of this writing is still proceeding. 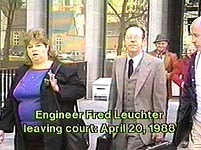 My initial conversations with Fred Leuchter took place in Boston on the 3rd and 4th of February, 1988. I was impressed with the conciseness of his answers to my questions and by his ability to explain every detail of gassing procedures. He confirmed to me the particularly dangerous nature of an execution by hydrocyanic gas. Executions using this gas were carried out for the first time in the United States in 1924, but as late as 1988 major difficulties still existed in the construction of execution gas chambers, including the problem of leakage. I noticed that Fred Leuchter did not question the standard notion of the Holocaust. After my return from Boston to Toronto and after I had reported to Ernst Zundel on my discussions with Fred Leuchter, Mr. Zundel decided to ask the latter to prepare an expert opinion on the alleged gas chambers at Auschwitz, Birkenau and Majdanek. Mr. Leuchter accepted the assignment after a weekend in Toronto reviewing wartime aerial photographs of the camps, plans of the crematoriums and alleged gas chambers, documents on Zyklon B and slides taken of the sites in the 1970's by the Swedish researcher Ditlieb Felderer. 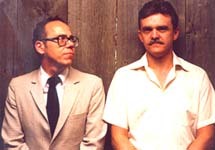 On February 25, 1988, Mr. Leuchter left for Poland together with his wife Carolyn, his draftsman Howard Miller, cinematographer Jurgen Neumann, and Polish language interpreter, Tijudar Rudolph. They returned eight days later on March 3rd. Upon return, Fred Leuchter wrote his report of 192 pages including appendices. His conclusions were clear: the evidence was overwhelming that there were no execution gas chambers at Auschwitz, Birkenau and Majdanek and that the alleged gas chambers at these sites could not have been, then or now, utilized or seriously considered to function as execution gas chambers. On the 20th and 21st of April, 1988, he stood in the witness stand in Toronto. At first, he replied to the questions put to him by Mr. Zundel's defense lawyer, Douglas H. Christie, the latter assisted by Keltie Zubko and Barbara Kulaszka. 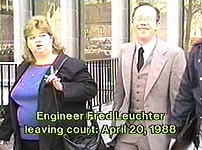 Mr. Leuchter then faced cross-examination by the Crown Prosecutor, John Pearson, an official who had been assisted throughout the trial by another Crown Attorney, a law clerk and frequent consultations with Jewish advisors sitting immediately behind him in the courtroom. The examination and cross-examination took place in the presence of a judge and an eleven-member jury. In the courtroom, the atmosphere was one of extreme tension. I was sitting beside a number of Revisionist experts, including Dr. William Lindsey, chief research chemist for Dupont Corporation before his retirement in 1985. Everyone in the courtroom, regardless of their own personal viewpoints on the topic under examination, were acutely aware, I think, of participating in a historical event. The myth of the gas chambers was ending. 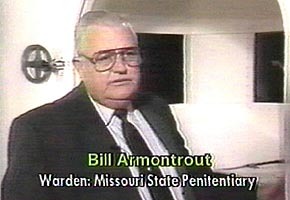 The previous day, the director of the Missouri State Penitentiary, Bill Armontrout, had given testimony explaining the procedures and practical operation of a cyanide gas chamber. For every attentive listener it was revealed that if it was so difficult to execute a single person in this manner, then the alleged execution of hundreds of thousands of persons by the Germans using Zyklon B would equal the problem of trying to square the circle. Following Fred Leuchter on the witness stand came Dr. James Roth, Ph.D. (Cornell Univ. ), Manager of Alpha Analytical Laboratories in Ashland, Massachusetts. Dr. Roth reported on the analysis of samples taken from the walls, floors, ceilings and other structures inside the alleged gas chambers of Auschwitz I and Birkenau. These tests revealed either no detection of traces of cyanide or extremely low levels. The only exception was the control sample number 32 taken from Delousing Facility Number 1 at Birkenau. These results were graphically produced in Appendix I of the Report and displayed to the jury on an overhead projector. the difference in detected cyanide between the delousing facility on one hand and the alleged gas chambers on the other, was spectacular. The extremely low levels of cyanide found in some crematoria was likely, in my opinion, to have resulted from disinfection of the premises during the war. I think I was the first to point out that all studies of the alleged German execution gas chambers using Zyklon B should commence with a study of the American execution gas chambers. As early as 1977, with the help of an American friend, Eugene C. Brugger, a lawyer in New York City, I began an inquiry into this area. During this research, I obtained information from six American penitentiaries, those of San Quentin, California; Jefferson City, Missouri; Santa Fe, New Mexico; Raleigh, North Carolina; Baltimore, Maryland; and Florence, Arizona. I was forced to conclude at that time that only an expert in American gas chamber technology could finally determine whether the alleged German execution gas chambers were capable of having been used as described in Holocaust literature. During the next several years, my articles on German gas chambers always referred to the American gas chambers. These articles included "the Rumor of Auschwitz or the Gas Chamber Problem", published on the 29th of December, 1978 in a French daily newspaper, Le Monde, and a long interview published in August, 1979 in the Italian periodical Storia Illustrata. I visited the gas chamber in Baltimore, Maryland in September, 1979 and obtained eight photographs of the chamber and additional documentation. Then, during a meeting held in New York City under the chairmanship of Fritz Berg, I showed the Gas Chamber Procedure Check Sheet of the Baltimore penitentiary and discussed its implications. In 1980, in the first issue of the newly-created Journal of Historical review, I published an article entitled "The Mechanics of Gassing", in which I described in some detail the gas chamber procedures used in the United States. In the same year, I published in "Verite Historique ou Verite Politique? ", the eight photographs of the Baltimore gas chamber. My video entitled "The Gas Chamber Problem", made in 1982, began with an analysis of the American gas chambers. In 1983, I prepared for the Institute for Historical Review, Los Angeles, a book in English on the Holocaust controversy which was to include, for the first time, a list of the questions put to the penitentiary wardens and their answers. The book, however, was never published: on July 4, 1984, American Independence Day, the archives of the Institute were destroyed by arson. This fire, for all intents and purposes, destroyed the financial viability of the Institute and a number of projects, including that of my book, were abandoned. The Holocaust has appeared to be a subject of enormous proportion. But this "giant", as Dr. Arthur Butz has pointed out in "The Hoax of the Twentieth Century," is a giant with feet of clay. To see the feet of clay, one need only go to Auschwitz Concentration Camp in Poland. In the words of Dr. Wilhelm Staglich, "the extermination thesis stands or falls with the allegation that Auschwitz was a 'death factory'." And for me, the whole mystery of Auschwitz is, in turn, concentrated on the 65 square metres of the alleged gas chamber of Auschwitz I and on the 210 square metres of the alleged gas chamber of Birkenau. These 275 square metres should have been forensically examined immediately after the war by the Allies, but no such examination was ever carried out then or since. The Polish examining magistrate, Jan Sehn, ordered some forensic examinations at Auschwitz but not of the alleged execution gas chambers themselves. Research by revisionists has shown that the places alleged to have been execution gas chambers could not have been used for such a purpose. Ditlieb Felderer published photographs indicating the flimsy construction of vents and doors to the gas chambers and the lack of Prussian blue stains on the walls. I myself had discovered in 1975 in the archives of the Auschwitz State Museum (archives which are well-guarded by the Communist officials) the plans of these alleged gas chambers and was the first to publish them in various books and articles. These plans were also shown at the first convention of the Institute for Historical Review in Los Angeles in 1979, when Mr. Zundel was present. 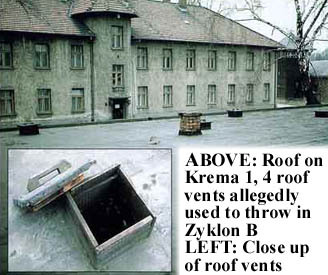 In reality, these alleged gas chambers had been mortuaries or, as indicated on the plans, "Leichenhalle" for Krema I (later transformed into an air-raid shelter) and "Leichenkeller" for Krema II. Nevertheless, in order to obtain an entirely scientific confirmation of what simple common sense compelled us to see and what revisionist research work and documents had revealed, it was necessary to look for an American gas chamber specialist. I desperately tried to find such a specialist, but frankly, I had little hope of finding a man who was not only an expert in gas chamber technology, but also one courageous enough to carry out such an investigation in a Communist country and to publish the results if ever they confirmed revisionist conclusions. Fortunately, I was wrong. Fred Leuchter was this specialist. He went to Poland, conducted the forensic examination, wrote his report and testified in a Canadian court on behalf of Mr. Zundel. In so doing, he has quietly entered history. Fred Leuchter is a modest but quietly determined man who speaks precisely. He would be an excellent professor and has the real gift of making people understand the intricacies of any difficult problem. When I asked him whether or not he was afraid of any dangerous consequences, he replied, "A fact is a fact." Upon reading the Leuchter Report, David Irving, the famous British historian, said on April 22nd, 1988 during his testimony in Toronto that it was a "shattering" document which would become essential for any future historian writing on the Second World War. Without Ernst Zundel, almost nothing of what has now transpired would have been conceivable. He sacrifices everything in his search for historical accuracy and lives under difficult conditions, facing influential and powerful enemies. The pressure on him is permanent and takes the most unexpected and sometimes, the most vicious forms. But he has a strong personality and charisma. He knows how to analyze any given situation, to evaluate the ratio of forces, to turn adversity into advantage. From all parts of the world he attracts and mobilizes competent people. He is a profound man, a genius who combines common sense with a keen understanding of people and situations. He may once again go to prison for his research and beliefs or be threatened with deportation. All this is possible. Anything may happen when there is an intellectual crisis and a realignment of historical concepts of such a dimension. Revisionism is the great intellectual adventure at the end of this century. Whatever happens, Ernst Zundel is already the victor. He is the pacifist-activist who has achieved this victory through the powers of reason and persuasion. P.S. 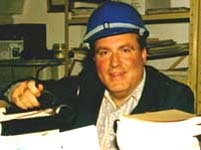 Ernst Zundel was found guilty by the jury on May 11, 1988 of knowingly spreading false news about the Holocaust. He was sentenced to nine months imprisonment and was granted bail after signing a gag order, promising not to write or speak about the "Holocaust" until the end of his appeal proceedings. He thus joined Galileo. P.S.S. 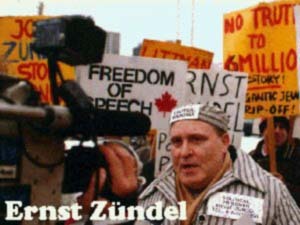 The Supreme Court of Canada, on August 27, 1992, overturned the conviction of Ernst Zundel and declared the law under which he was dragged through the courts of Canada for nine years as unconstitutional. Canada has refused to apologize to Ernst Zundel for his ordeal, and has turned down his request for compensation for his legal costs etc.